Being a busy gal one needs some quick but cute ways that they can add some vintage into their daily outfits. Not everyone can or wants to walk out of their house looking as if they stepped off a time machine and not everyone has the time to dedicate the precision that it takes to create look from a specific decade. 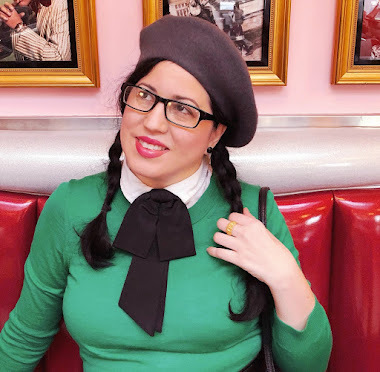 So I wanted to show you how I created a simple and easy casual day look inspired from the 1960's. 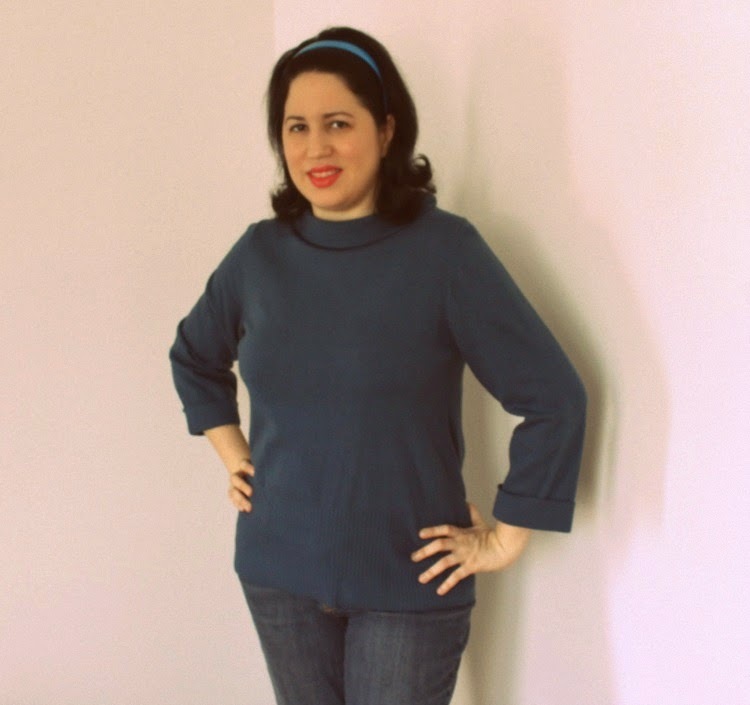 I started out by wearing a 60's inspired sweater from Boden called the Pamela sweater. Super comfy and super cute, I definitely want to get it in more colors. I paired it with my jeans for my casual look. I set my hair in hot rollers but you can also use steam rollers or large rollers overnight. I do plan to do a tutorial of my steam rollers soon so keep a look out for it. 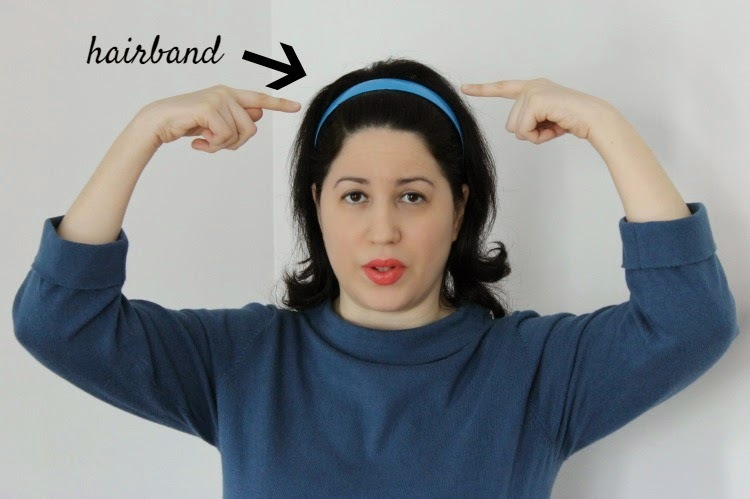 I slapped on a headband and of course forgot my earrings for this little mini shoot but a pair of post earrings or hoop earrings would go great with the look. My makeup was minimal and I would like to think that women on an everyday basis didn't put on fake lashes and cat eye makeup. I did use liner and it was very thin. I think next time I will put it on a little thicker but I like the simplicity of it especially if I am going out with my family and running some errands. I used MAC's liner, Benefit's mascara, a brow brush and brow pencil, and a white eye liner to help open my eyes up a bit. My eyes being the odd shape they are I think I could have used some eye shadow and maybe half of a false eyelash to give my eyes a little kick but I am staying away from false lashes at the moment. At least when it comes to casual day looks anyway. For my lips I used a coral shade from MAC. I just love the color coral lately. Don't you? How do you create a casual vintage look for the daytime? What elements of vintage fashion, hair, and makeup do you incorporate into your everyday look? Daffny, your 60's style is too darn cute! That coral shade looks so lovely on you! 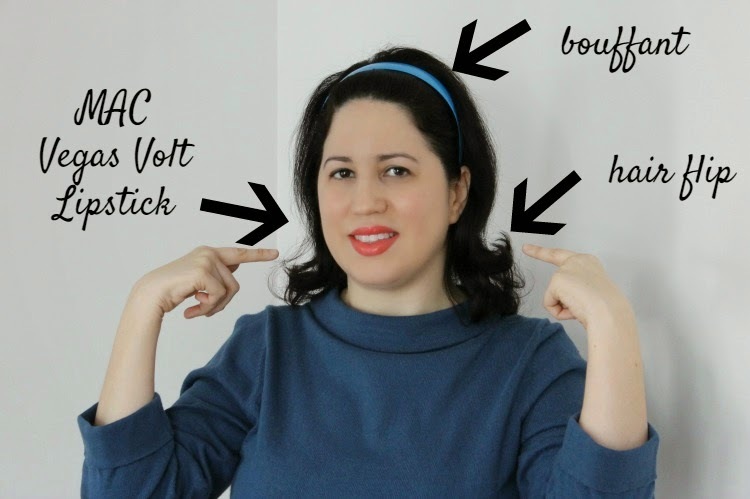 As for myself, for a 'casual 40's look' I'll usually pin curl my hair up at night, in the morning, use a hair-rat (ok, it's just a sponge roller) and give myself a little roll, leave the rest of my hair nice and curled. I'll go real light on my eye makeup, and have a bright bold red lip. I'll usually put on some clip-on earrings, and a bakelite bangle, and go about my day. Just like yourself, I too have noticed that 1960s fashion is quite laid-back and can be suitable as a casual daily look. One more great thing about the era is that a lot of outfits from that age has managed to survive the test of time. I really love the cut of that jumper. Beautiful! So charmingly pretty! The 1960s were made for you, dear gal! 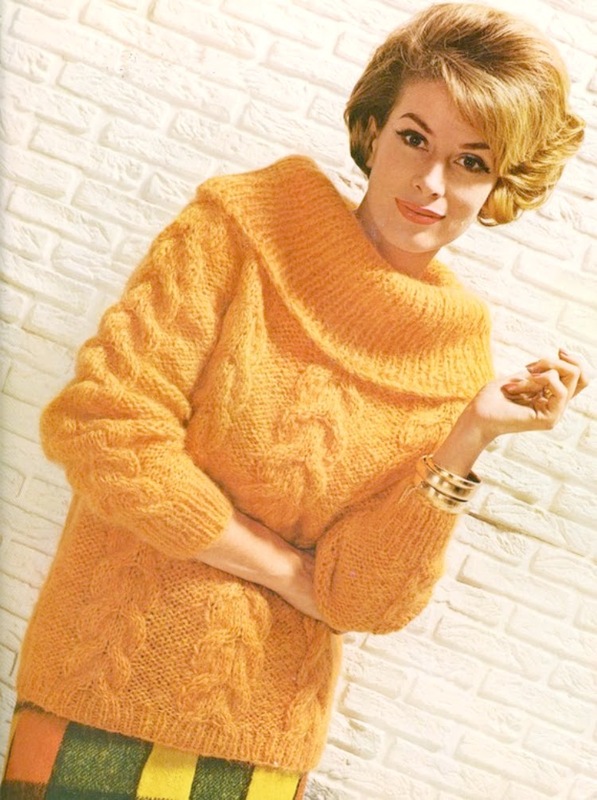 This is such a great post I adore the early 1960s but find it hard to style myself 1960's. The bouffant is my achilles heel. 2. Face Cream with an SPF of 18, 3. Face Powder applied under the eyes to cover my dark circles also on the shiny parts of my face. 4. Neutral eye shadow, flesh color to my brow bone, light brown to my eye lids and dark drown in the crease. Topped with grey pencil eye liner only to the top of my lash line thick, mascara top lashes only. Next is brows eye brow powder applied with and angled brush. 5. Lip stain, my favorites are the new ones by Wet n Wild Mega Slicks Balm Stain continuous moisture does not bleed or feather. My other favorite brand is Jordana Twist & Shine Moisturizing Balm Stain. I find using lipstick during the day very drying on the lips and only use it for nights out. With a lip balm stain I never have to worry about my lips becoming super chapped. Button up shirts with long or short sleeves. Jumpers with short sleeves in solid colors that can be used instead of a blouse. Low wedged shoes and saddle shoes (I'm on my feet a lot). Jewelry: Pearls necklaces/earrings, pins, sweater clips, and small silver hoop earrings.